Warning of methane blasts in Kara Sea adjacent to Yamal craters caused by gas eruptions associated with melting permafrost due to global warming. Huge attention has focused on the mysterious large holes that have suddenly appeared in the Siberian Arctic recently, and now there is evidence of a similar process underwater in southern areas of the Kara Sea. Large mounds - described as pingos - have been identified on the seabed off the Yamal Peninsula, and their formation is seen as due to the thawing of subsea permafrost, causing a 'high accumulation' of methane gas. These mounds 'are leaking methane' and their 'blowout potential' poses a significant 'geohazard' to energy exploration in Arctic waters, according to new research by scientists at Centre for Arctic Gas Hydrate, Environment and Climate (CAGE) in Norway, supported by the Federal Subsoil Resources Management Agency of Russia. For example, in a little-reported incident 20 years ago, during 'geotechnological drilling' by Russian vessel Bavenit in the Pechora Sea, a pingo gas deposit was opened, threatening the ship's safety with a sudden methane release, a process that has been claimed as the cause of the Bermuda Triangle in the Atlantic Ocean. 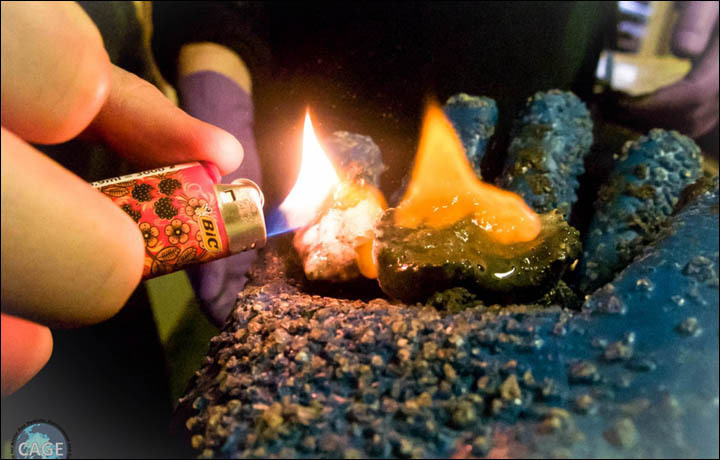 Gas hydrate is also known as the ice that burns. You can literally set it on fire. Dr Pavel Serov, lead author of the research which is published in the Journal of Geophysical Research, said: 'Pingos are intensively discussed in the scientific community especially in the context of global climate warming scenarios. 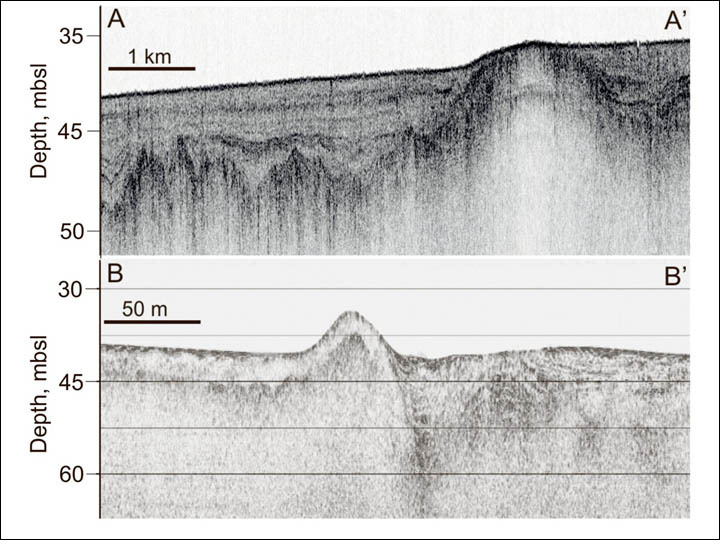 The researchers focused on 'two subsea pingos that were identified offshore (of) the very same area of the mysterious Yamal peninsula craters', reported the CAGE website. The Siberian Times has led the way in drawing attention to the land craters, publishing the views of scientists on their formation and spectacular pictures of the giant holes taken during expeditions to the new phenomena. After initial doubts, scientists now believe the craters were formed by pingos erupting under pressure of methane gas released by thawing of permafrost caused by warming temperatures. Now the Norwegian study 'shows how important methane accumulation is for the formation of subsea pingos'. These structures are 'now found strewn on the ocean floor in the Arctic shallow seas', according to the research by CAGE, part of UiT The Arctic University of Norway. Initially it was thought the undersea pingos were 'relics of the Ice Age', but the groundbreaking new research indicates the reverse, indicated CAGE director Professor Jurgen Mienert, a co-author of the paper. 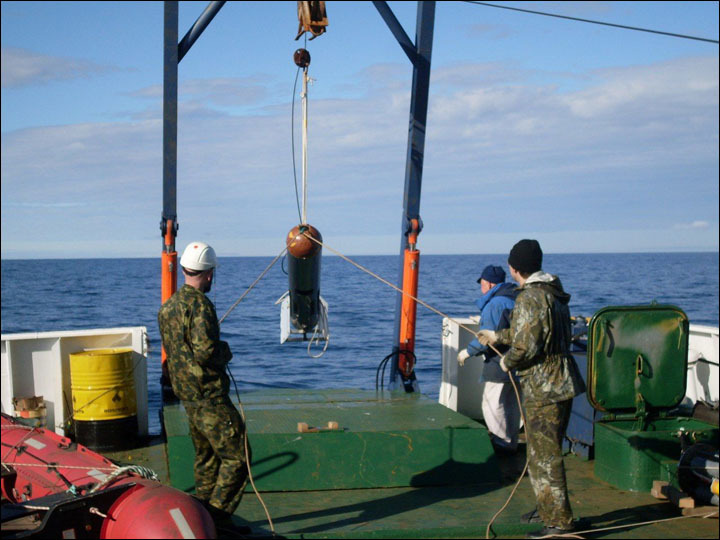 Crucially, 'gas leakage from one of the ocean floor pingos offshore (of) Siberia shows a specific chemical signature that indicates modern generation of methane', state the researchers. Likewise the processes leading to methane eruptions on the neighbouring peninsula are seen as very recent. 'On land pingos are mainly formed when the water freezes into an ice core under soil, because of the chilling temperatures of permafrost,' states the website synopsis. However, subsea pingos, may be formed because of the thawing of relict subsea permafrost and dissociation of methane rich gas hydrates. Gas hydrates are ice-like solids composed of among other things methane and water. They form and remain stable under a combination of low temperature and high pressure. 'In permafrost the temperatures are very low and gas hydrates are stable even under the low pressure, such as on shallow Arctic seas. 'The methane creates the necessary force that pushes the remaining frozen sediment layers upward, forming mounds,' said Dr Serov. Research indicates that 'subsea pingos can potentially blow out' without the 'massive attention' that has greeted the land pingo eruptions, which leave craters visible from space in their wake. Yet in the Kara or other Arctic seas 'massive expulsions of methane' go into the ocean. The Siberian Times in September carried a warning from Russian scientists of the threat on Yamal Peninsula - location of world's largest natural gas reserves - of methane explosions. Scientists from Trofimuk Institute of Petroleum Geology and Geophysics said the process by which a series of craters formed was caused by the melting of gas hydrates and the emission of methane. Scientists narrow down the cause and think it is related to warming. This accumulates in a pingo - a mound of earth-covered ice - which then erupts causing the formation of the holes. One land pingo is believed to be poised to explode 'at any moment'. It is now being constantly monitored by a Russian space satellite in an attempt to catch the moment when the eruption occurs. Dr Igor Yeltsov, deputy director of the Trofimuk Institute, said of the newly-formed land craters: 'In the last decades, temperatures have climbed and caused the release of gas hydrates. 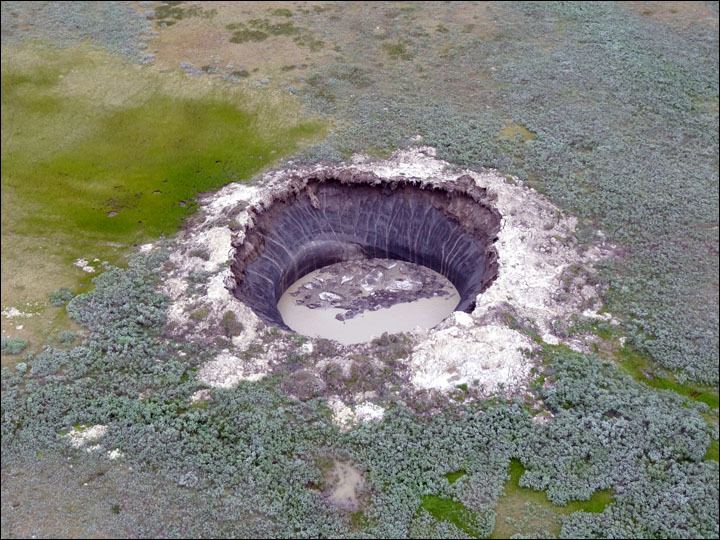 The largest Yamal hole 'is a unique object for science. We did not have any chance to study such phenomenon before. Such eruptions 'can easily repeat', he warned. 'We need follow closely the processes with permafrost and gas hydrates on Yamal,' he said.